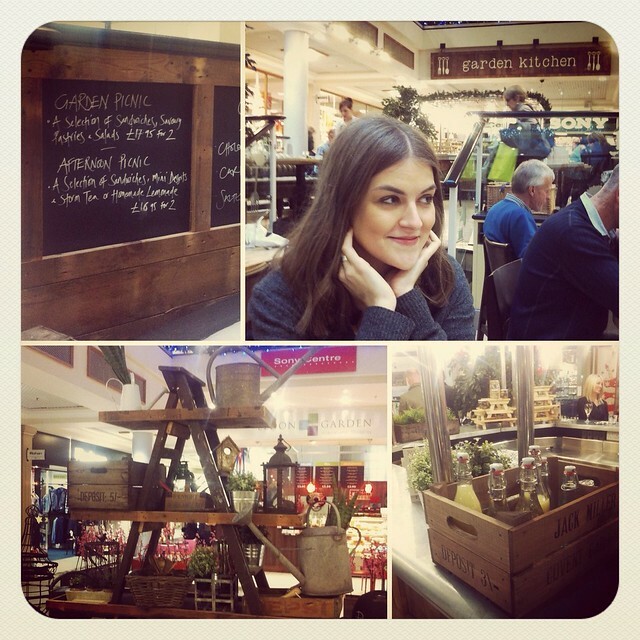 In my last post I mentioned my recent visit to, Garden-Kitchen-Newcastle-Eldon-Square.. being a relatively new addition to Eldon Square, there are still plenty of people who haven’t tried it out, or who even know where it is for that matter.. If you’re one of those then it’s in Eldon Square gardens (where Popolo used to be!) I visited the restaurant for the first time when it had just opened but until last weekend I hadn’t managed to get around to going back, so when I was offered the chance to try one of their delicious picnics, I couldn’t resist. Like I’ve said before, I’m not really a foodie.. I’m just a bit greedy but I’m sure that helps! Since Becky was up for the weekend visiting (cos I don’t know if I mentioned but it’s my birthday tomorrow..), I thought it may be nice to take her along to my review so she could help me make an informed decision about the food. Launched by the same folk as the ones behind the Baltic cafe and the famous SIX, Garden Kitchen is Fresh Element’s latest venture offering homely, thoroughly British cuisine. One of the things I love about Garden Kitchen is the attention to detail. The whole restaurant has a very rustic feel, With an actual picnic table at one end, watering cans as decoration and wooden crates stacked with of old lemonade bottles. It’s almost as if you’ve wandered into the kitsch little allotment of some old bloke who’s just decided it’s a good idea to stop for lunch. The menu itself is similarly eccentric, offering interesting and fresh takes on British classics. After perusing the menu for all of five minutes, we decided to opt for the signature Garden Picnic.. although it was kind of a toss up between that and the Afternoon Picnic, a more traditional afternoon tea comprising finger sandwiches, scones and other sweet treats accompanied by tea or cloudy lemonade. I’m pretty sure it was the scotch eggs that swayed it.. As soon as our picnic arrived, we were faced with huge helpings of homemade sausage rolls, celeraic remoulade (or posh coleslaw as it turned out to be), mini scotch eggs, potato salad, crustless sandwiches and freshly baked cheese and tomato tart! In between mouthfuls of sausage roll, we nodded at each other appreciatively until it was all gone, then helped ourselves to a slab of salted caramel cake made by the lovely lasses at Pet Lamb Patisserie. 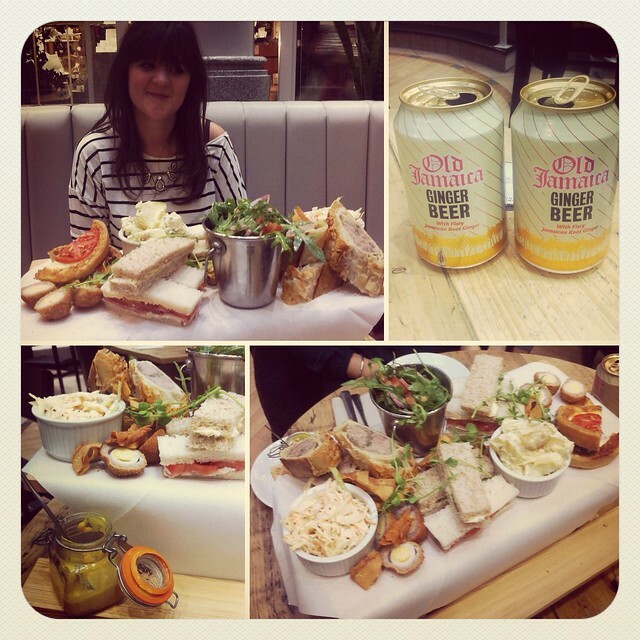 What with a posh pub platter served on a miniature picnic table, condiments presented in teeny jars, and bucket loads of ginger beer, it felt as if we’d wandered straight into a Famous Five novel. Yum looks so so good! Wow. This really looks mouth watering. Love the look of the place, too. hey Katie! Yeah I did mention you and I've included the link to your website in the post 🙂 We tried your amazing salted caramel cake, so delicious!